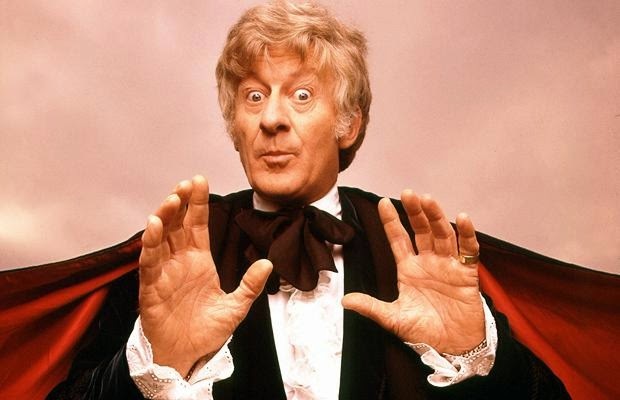 DOCTOR WHO: The golden era of JON PERTWEE | Warped Factor - Words in the Key of Geek. 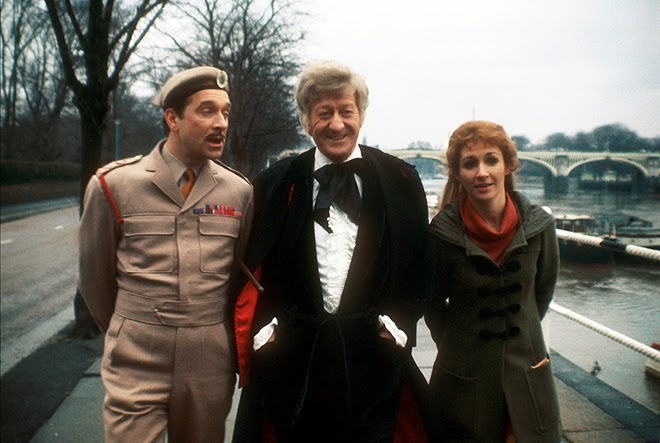 Christopher Morley revisits the Jon Pertwee years of Doctor Who. Was Jon Pertwee's Third Doctor really little more than a ' black belt Liberace'? Lets look back & find out! In reality though the truth was far starker- BBC budget cuts proving to be the real enemy. But happily imagination was the real winner- Pertwee's first season ( Spearhead From Space- Inferno) proving him an able successor to Troughton. But where did the idea for his costume come from? Jon himself claimed that he'd found the smoking jacket, ruffled shirt & cape with which he'd become synonymous in storage at the BBC, & worn it to one of his first meetings with Terrance Dicks & company. They loved it, & so the ' dandy Doctor' was born! Or so you might think. But costume designer Christine Rawlins, who worked on the whole of that Season Seven, claimed it was she who came up with the look- based on the title character of Adam Adamant Lives! In any case the slate was wiped clean- a new action hero Doctor, alongside a new companion in the shape of Caroline John's Liz Shaw. And let's not forget he loved gadgets, too! She arrived just in time for the return of the Autons alongside a new foe, the Master- another Time Lord who served as the dastardly bearded yin to the Doctor's yang, played with gusto by Roger Delgado- in the Season Eight curtain raiser Terror Of The Autons. He'd pop up in the remaining four stories ( The Mind Of Evil, The Claws Of Axos, Colony In Space & The Daemons) too, a recurring menace. Colony would also prove notable in that the Doctor is granted a brief reprieve from his exile in order to assist the Time Lords in stopping the Master from using information stolen from them on a ' doomsday weapon' to intervene in an industrial dispute on Uxarieus, as well as being the first outing of a new design for the sonic screwdriver. More new foes would make themselves known in time for Season 9- the Ogrons appearing alongside the Daleks in Day Of The Daleks & The Sea Devils proving to be a first glimpse at the aquatic near- relatives of the Silurians as well as a return for the Master. Sadly, Roger Delgado's untimely death meant his last appearance came in Frontier In Space which also features the Draconians, favourite monster of Jon Pertwee himself- he apparently loved that the costumes for them allowed greater room for expression by the actors playing them. What a pro! As just reward for not sitting around twiddling his thumbs during his exile, the Doctor would finally be given back his knowledge of space/time travel in Season Ten opener ( and indeed celebration of Doctor Who's tenth anniversary) The Three Doctors. Then it was off to the Carnival Of Monsters, featuring an appearance by Ian Marter as John Andrews- he would go on to play Harry Sullivan, a companion of the Doctor's next incarnation. ...in much the same way Jenna Coleman as Clara has done since Matt Smith's Eleventh gave way to Peter Capaldi's Twelfth Doctor. All of which should prove there's more to the Third Doctor than just foppish martial arts enthusiasm- HAIII!! !